The sequel to the original rumbler is back and re-mastered in 3D. Slam the asphalt with bigger, better and totally devastating attacks. Skull crushing ex-wrestler Max Thunder joins up with Axel and Blaze to throw earth shattering body slams and fist attacks. New thrasher Skate slices punks with high speed inline attacks and spinning jump kicks. Use secret weapons to bash your way through gangs of bikers to rescue your friend and defeat Mr. X. 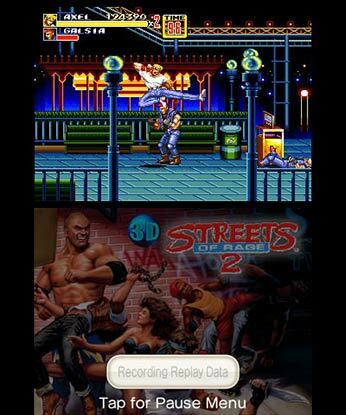 Streets of Rage 2 3DS has everything going for it as a downloadable retro game. 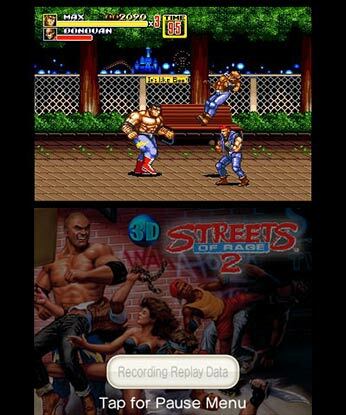 Taking good use of the 3D effect, decent new modes, and offering players one of the best ways to play Streets of Rage 2 on the go, if you’re a fan, I don’t see how you could resist this brawl. Back in the day, Streets of Rage 2 was considered one of the best video games of all time and much of that proclamation still rings true. 3D Streets of Rage 2 is as fun as it used to be in the ’90s and stands out in the genre. In addition to new games modes, the ability to save a game at any point in time makes a great game even better. 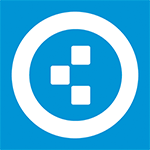 It’s been perfected upon and an overall better experience since you can play on the go. Fans of the original and newcomers alike will have fun playing this remake. When it comes down to it all, Streets of Rage 2 is just magnificent. And when you add in a price point of £4.49 the game becomes simply essential. 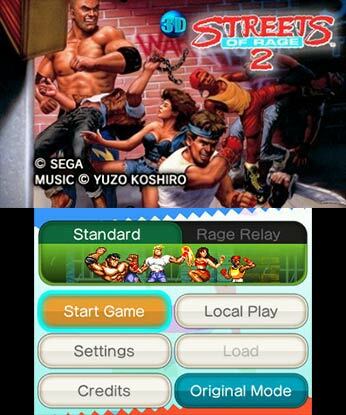 If you own a 3DS you should purchase SOR2, it’s that simple. I don’t think that any game out there is perfect, but this one comes pretty damn close! Still as good today as its was back in the 90s. Co-op and duel play still on offer. Alternate game modes. Button mapping works well. The 3D effect adds to the experience so much it's worth playing again even for those of us who have completed it countless times, That, and to enjoy the timeless music and satisfying feel of fists on flesh once more. If you're reliving your youth, you'll find this is one game where rose-tinted spectacles haven't pulled the wool over your eyes. It is as good as you remember. If you're coming at this fresh, we envy you; enjoy every second. Streets of Rage 2 is back with a vengeance and it's thoroughly deserving of your time. A true classic. 3D Streets of Rage 2 takes a game that was already infinitely replayable (solo or multiplayer as this version does allow for co-op if both players have the game) and gives you even more ways to experience this classic brawler. The impeccable port combined with the additional features and cool 3D effect make this the definitive version of one of the pinnacles of the genre. For those who played this classic back in the day, memories will come flooding back. If the multiplayer options supported online play, this would be perfect. Regardless of that, though; SEGA and M2's latest truly is a masterpiece that will be enjoyed by people of all ages for many years to come. For anyone who hasn't played this yet? Why not? 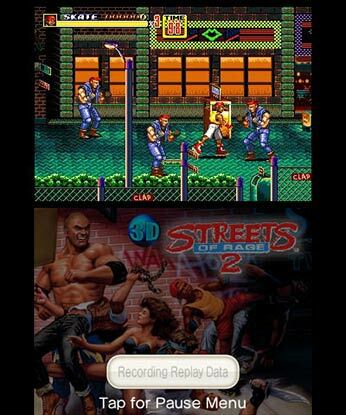 Así pues, 3D Streets of Rage 2 es una oferta ineludible para los fans de las peleas clásicas, cuyas carencias de entonces (IA y reiteración de algunos enemigos, principalmente) son algo más visibles hoy, pero cuyo carisma sigue intacto. Si a eso añadimos las nuevas opciones, no podemos más que gritar "Uryaaa" de alegría. 3D Streets of Rage II es, sin lugar a dudas, la mejor versión que jamás se ha realizado de este clasicazo de los beat 'em up. Montones de opciones para configurar el juego y la partida a nuestro gusto, distintas modalidades, un efecto 3D muy conseguido y espectacular, y la misma diversión de siempre aderezada por una banda sonora de lujo. 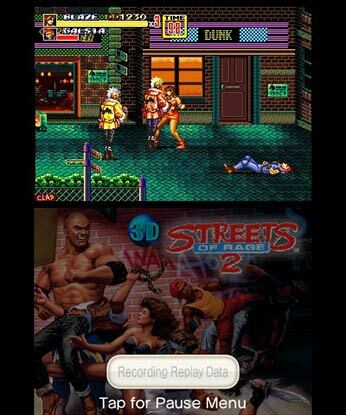 Recuar ao passado de vez em quando sabe muito bem e Streets of Rage 2 é sem dúvida um título perfeito para o fazer. Um dos mais brilhantes beat'em ups dos anos noventa chega mais uma vez aos jogadores pelas mãos da M2 em mais um trabalho magnífico com opções de jogo que podem oferecer uma experiência mais agradável e atraente. 3D Street of Rage 2 è una conversione che rispetta pienamente l'originale e che è perfettamente in grado di restituire il gameplay del coin-op sia di mostrare uno dei migliori effetti 3D che si siano visti sulla console Nintendo. Una chicca per nostalgici, ma anche una lezione di storia per chi è curioso di sapere a cosa si giocava trent'anni fa.